This morning I was tidying up my sewing room (seriously one of my favorite things to do) and I came across quite a few projects that I enthusiastically started but never actually got around to finishing. Some of them I started in the past few weeks and a few are from the last few… years. The shame. 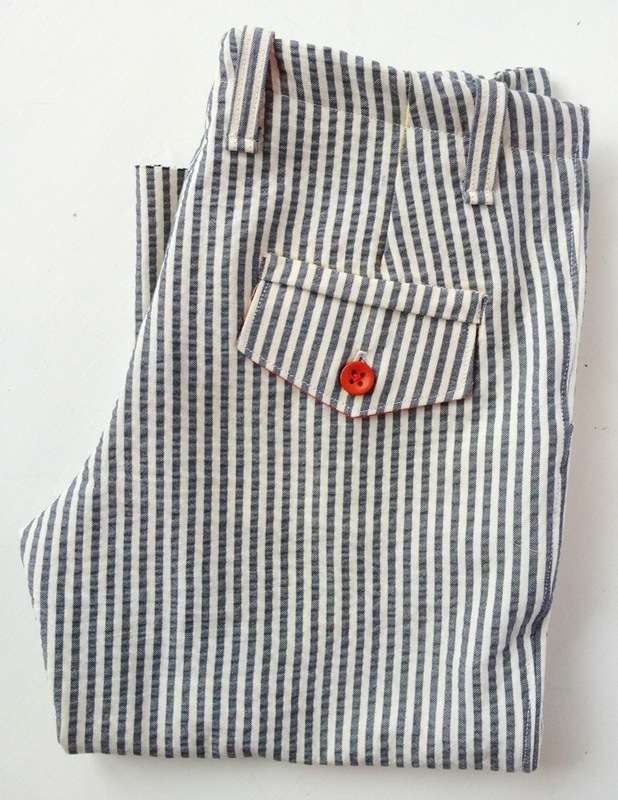 Last month I actually found a half sewn pair of pajama pants that I started when I was in university in the 90’s. So now I’m mentally gearing myself up to finish up these projects once and for all and get started on some new ones. Please tell me I’m not alone with this problem. Do any of you out there also have some unfinished projects taking up space and taunting you whenever you see them? Here are some Seersucker shorts that I made for my son. The pattern was one of the most difficult I’ve ever done (thank goodness for friends with such great knowledge of pattern language!). 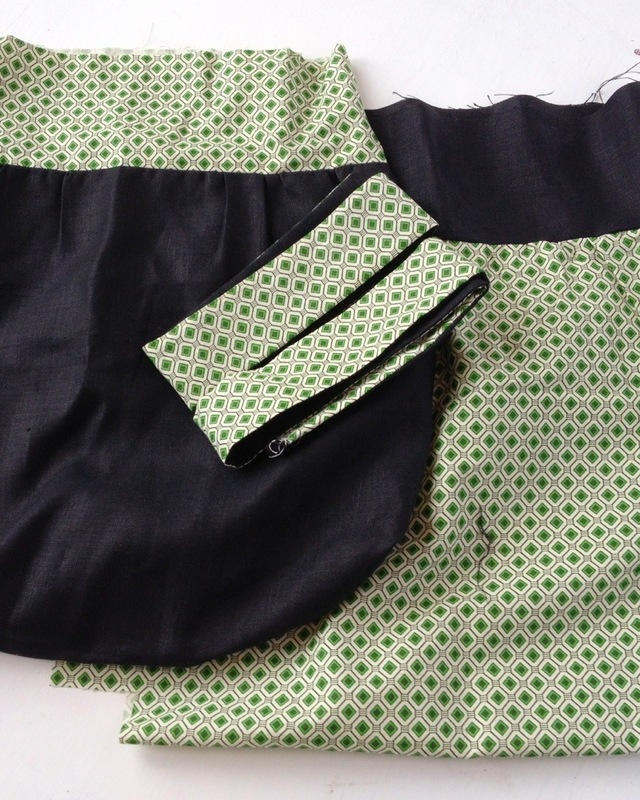 There are fancy pockets, belt loops, a zipper and way too many buttons and button holes. I learned a lot of great sewing techniques from these shorts. But I will never make them again in my life. Now I just have to motivate myself to hem them. Hemming is always my weak point. 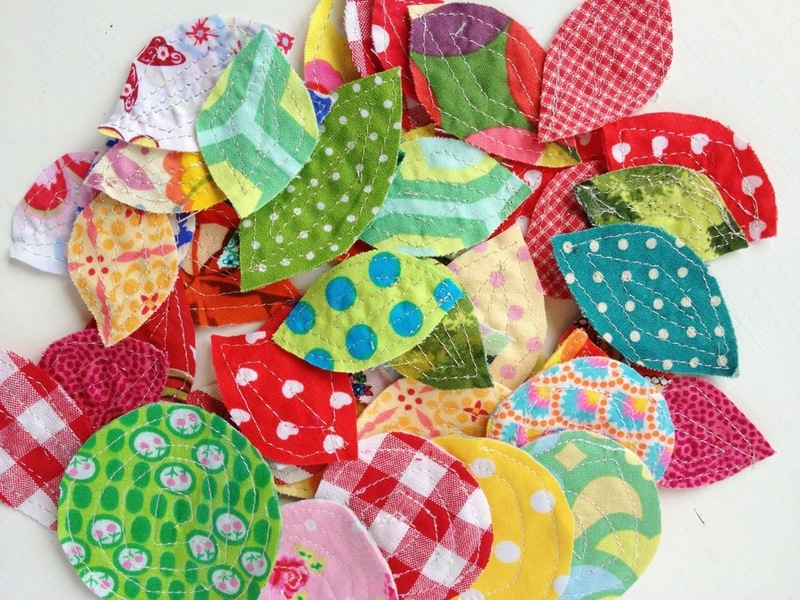 One day I holed myself up in my sewing room (about 8 months ago) and sewed up all of these fabric leaves and circles. I never really had a solid idea of what I was going to do with them but I was confident it would come to me sometime. It still hasn’t come to me. Any ideas for what to do with these out there? My mother-in-law and I started these dresses above during her time here at Easter. The pattern is from my newest sewing book Stof Voor Durf-Het-Selvers by Lies Bottermans and Griet De Smedt (as far as I know it’s only available in Dutch). They are absolutely lovely and so close to being finished. One needs a zipper installed (not my favorite job) and they both need to be hemmed. In any case, I’ll make sure they’re done by summertime. Maybe my Mother-in-law should return to finish them with me (hint hint). 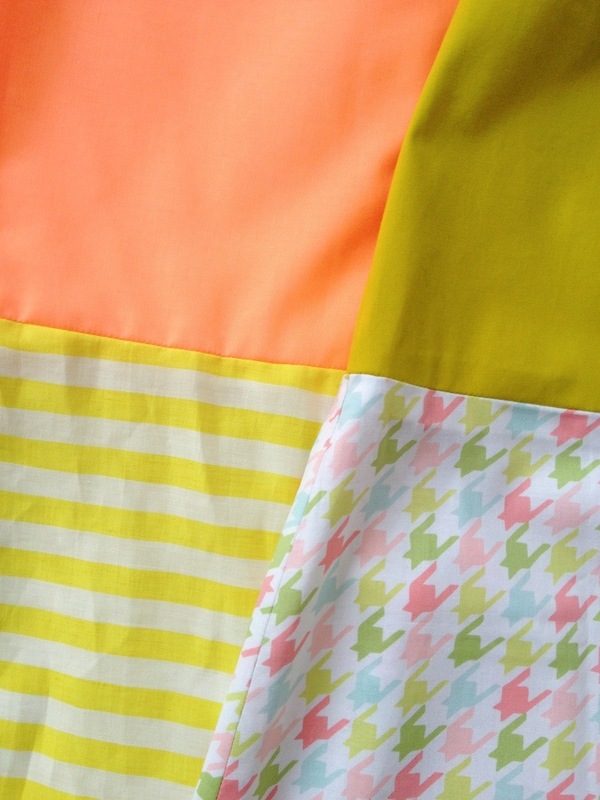 A little summer sleeveless top made with Max Mara fabric. I’ll be finishing it up with my sewing group this Friday. So at least I can check that one off my list right away. It’s a start! This is the project that I started about 18 months ago. I made about 8 of these purses for Christmas gifts and I guess by the time I started this one I just couldn’t bring myself to finish yet another one. It’s made with black linen and a soft thick cotton. I think I’m finally ready to finish it up and make a few more. If I can remember the pattern of course. So wish me luck on finishing all of these projects and making room (mentally and physically) for some new projects that I’ve had simmering in my head for a while. And if a few of you harassed me every now and then to see the finished products I’d really appreciate it. So happy to hear I’m not alone! Now I’m off to google abate jour…I have no idea what that is! I am on the floor in hysterics. And now I have a major craving for KFC! Obviously a family trait – I have a bookcase full of unfinished projects but you have inspired me – the games quilt, cine-colle printing, the photo book of trips to Italy, and so on, and so on. Photo books for Italy trips sounds interesting! Get on it! I’m definitely one for procrastination. I was supper excited when I finished my Halloween costume, of course, it was January and I had started it in September. Kind of skipped the deadline there. Anyway, on the productive end, I’m thinking those fabric circles and leaves you could turn into original coasters. You could tack one or two of the leaves onto each circle to give them a unique shape and they would be supper colorful! Just consider yourself ready WAY ahead of schedule for this coming Halloween! Love the coaster idea but the leaves and circles are actually really small. Maybe coasters for the doll china set for my daughters though! You could use them to embellish T-shirts of your daughters, especially if their small. Let’s start a club. I also wrote a post about this issue some months ago, hahaha!! Oh, those leaves and circles will look amazing in a string (bunting way;), maybe in your garden for the summer? The leaves and circles would make a great applique pillow. Thanks Patricia! I love that idea to have a little vase with the leaves on sticks. Definitely will give it a try. I used some to make a garland. 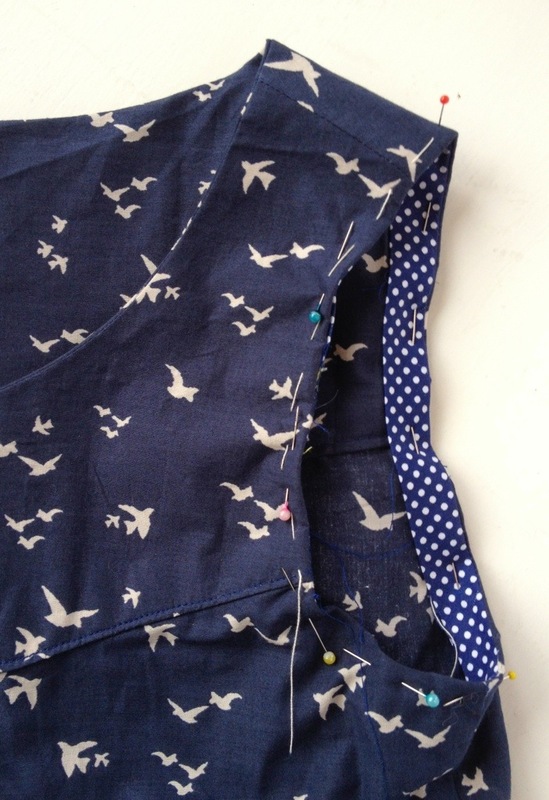 Use a thick thread and zip them up in the machine, no need for bias tape. I’ll see if I can find the website where I saw the idea. And I will only leave a project unfinished if I don’t like it. So you are lucky that you have good projects to finish. I only have crappy half done stuff lying around here that i don’t have the heart to throw away. Always good to hear I’m not alone!